Representing digital data visually was the challenge of the 2017 ACCES visualization contest, whose award ceremony took place on February 26, 2018. The projects of this second edition, on the theme of computational thinking, were exhibited at EPFL until 21 March and are still visible on the ACCES website. 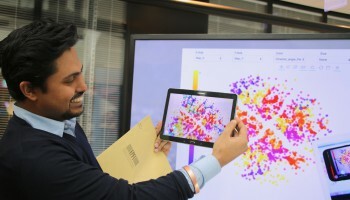 Organized by ACCES, the EPFL platform for Application-Centered Computational Engineering Science, and supported by MARVEL, the second edition of the ACCES visualization contest rewarded digital projects presented in images (static, dynamic or interactive). Twenty-nine participants, all students, PhD students or postdocs from EPFL, presented the result of a work integrating concepts of computational thinking. The participants were judged according to three criteria: the first one encompasses creativity, clarity and aesthetics; the second one, the visual communication of science, and the third one, the use of computational thinking. "Our goal was to develop the pedagogical aspect of the contest. We wanted to push the students to think about the tools of computational thinking and on the impact of developing their visual communication skills on their careers," says Mark Sawley, senior scientist and coordinator of the contest. The aim was to make participants aware of the importance of communication though images. "As researchers and engineers, it is essential to show our work to the public in a clear and interesting way," emphasized Nicola Marzari, president of ACCES and director of the NCCR MARVEL, co-organizer of the contest. 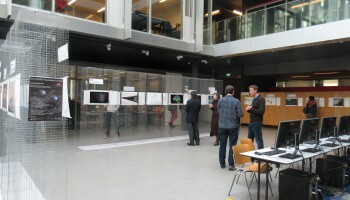 All the projects were exhibited from 26 February until 21 March at EPFL. They are still visible on the ACCES website. 1st prize : Michele Simoncelli, "Molecular dynamics in a supercapacitor"
2nd prize: Vytautas Navikas, "Ion channel clustering"
3rd prize: Jonathan Rafael-Patino, "From particle dynamics simulations to a magnetic resonance signal"
1st prize: Sina Shamsoddin, "Flow through a vertical axis wind turbine farm"
2nd prize: Enrico Milanese, "Akantu through time"
3rd prize: Sebastian Leguizamon, "A multiscale model of hydroabrasive erosion"
1st prize: Sandip De, "Interactive virtual reality visualization of atomic structure data"
2nd prize: Quentin De Longraye, Victor Le et Aymen Gannoumi, "DataMoviz - Deep into the movie scene"
3rd prize: Raphaël Steinmann, Semion Sidorenko et Alain Milliet, "Evolution of nuclear experiments on our planet"
A special mention for the use of computational thinking was awarded to Sebastian Leguizamon.